In the post, The 8 Most Annoying Comments Sourcers Hear From Recruiters, I mentioned that to minimize the tensions between sourcers and recruiters, leaders should establish very clear role definitions and a service level agreement (SLA) for all parties involved in the recruiting process. This document will be different for every organization, but should serve as a guide for all parties to know where the sourcers’ responsibilities stop, and the recruiters’ responsibilities start. I’ve seen very complex SLAs that break down every step of the process (I think every organization should have this). However, if your team is operating with little or no guidelines, you should use the example below to start to set some boundaries for how the team interacts. What is staffing doing to fill our jobs? What is sourcing doing to fill jobs? These are two questions we all struggle with that can sometimes be difficult to answer. Taking the following steps into consideration will demonstrate that you are aligned with business objectives, and that you are doing something proactive to fill jobs faster. 1. Determine what you need to achieve in order for the business to be successful. My other points below will support this statement, but as long as you keep service delivery paramount, the rest should be easy to answer through some critical thought, and good “voice-of-customer” conversations. Insert other metrics relevant to your organization. The number of submits required per week to fill a job, on average (this may vary based on business group). Determine what the recruiting team needs from the sourcing team to be able to submit candidates to their requisitions. Always consider what it takes to assess talent when determining your SLAs. Determine how quickly you need to get submits to the recruiters to meet objectives. Successful organizations will balance quality and speed, but never sacrifice quality for speed. Look at historical data to determine what did and did not work in the past. Set SLAs that support always doing the right things. Stop doing what has already been proven not to work. 4. Examine your current recruitment process. It’s not a trade secret that some organizations are bogged down with administrative duties that recruiters are tasked with. How can sourcing bring top quality candidates to the table that will have minimal administrative impact on the recruiters so they can focus on driving hiring decisions? Set SLAs that support the answer to this question. One example that comes to mind are fully qualified candidates vs. Qualified/ Interested/ Available candidates (QIA). If your organization supports candidate submits that would require a deeper dive from the recruiter, that’s a best practice. 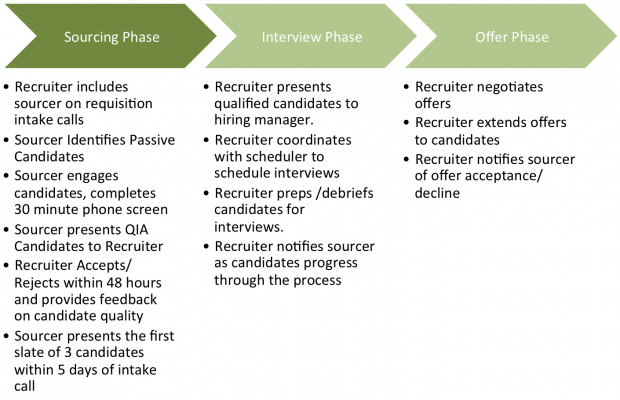 However, if there are capacity constraints on the recruiting side that need to be considered, an option could be to reduce the submit expectations from sourcing, then increase the candidate assessment quality expectation. Translated – spend more time talking to fewer candidates. 5. Address communication. Communication takes on very different meanings, it can be in the form of candidate write-ups, escalations, feedback, update calls, etc. SLAs need to support fast, quality feedback. This could be feedback from recruiter to sourcer, hiring manager to recruiter, or hiring manager to sourcer (if that’s how your business or customer prefers to be interacted with). Don’t slouch on this, lack of communication breaks down and diminishes recruitment results. Another communication point to consider is if the recruiter own all interfacing with the customer, or will the sourcing team stand front and center with their recruiting partner to influence business decisions. Work the answer to this question into the SLAs because calls and meetings take time away from core sourcing activities. 6. Analyze the industry. Scan the market and determine if supply equals demand. Look at your portfolio of requisitions. Where can you generate quick wins? Where do you have to deploy top talent to dig deeper than before to find the right candidates? Don’t rule out that SLAs could be different for each section of your business, depending on how your sourcing organization is structured. 7. Analyze the alignment of your recruiting and sourcing teams. Do you have a centralized (not aligned to business or specialty) team? Or a decentralized (industry, function or business specific alignment) team? Each of these team alignments have their pro’s and con’s, but staying focused on the topic at hand, depending on your structure or alignment, will influence on how you establish SLAs. 8. Ask yourself what culture you strive to have. SLAs and role specializations should support synergy between recruiting and sourcing. Think about what sourcing needs from recruiting, what recruiting needs from sourcing, and what the business needs from everyone. Use SLAs and Role Specializations as a tool to support an innovative, highly effective culture, that also leverages the collective genius of the entire staffing team. 9. Ask other organizations what they are doing. Don’t expect to walk away with the secret formula to success or any trade secrets. However, if we seek to leverage the collective genius of our team, why not leverage the collective genius of the sourcing community? Don’t be afraid to reach out and ask for time on their calendars. Give them a compliment and let them know what you are seeking to understand. Sourcing professionals love to have our egos inflated and talk about what we have accomplished. You may not get their trademarked Boolean search string, but they may be willing to share with you some best practices they have developed through lessons learned. It’s a lot to take in, and can seem like an uphill endeavor, but role specializations and SLAs are worth the effort. Please share any additional insights you have in the comments below. Originally published at www.sourcecon.com on May 30, 2013.